It is 2 years old at this point, but I only just discovered it today and it is bloody fantastic. Written and performed by Tim Minchin (@timminchin). Directed by DC Turner (@dcturner). Produced by Tracy King (@tkingdoll). See more at www.stormmovie.net. Today the 24th March is Ada Lovelace day whereby blogger around the world celebrate the achievements of women in technology and science by choosing one to profile and write about. This year I’m cheating a little and am linking to an excellent animation produced by Brainpop about the life of the lady herself who was called “The Enchantress of Numbers” by Charles Babbage. Wired reports that anthropologists have discovered signs of mass cannibalism in prehistoric Germany. I’m pretty sure that this very scenario is in Michael Marshall’s excellent book The Straw Men (or perhaps one of the other books of the trilogy) and is an indication of the early origins and activities of the murderous cult/family that The Upright Man is a part of. I just discovered by accident the terminology for the unusual colouration of my eyes. Central heterochromia is an eye condition in which there are two different colors in the same iris. Central heterochromia is where the central (pupillary) zone of the iris is a different color than the mid-peripheral (ciliary) zone. Eye color is determined primarily by the concentration and distribution of melanin pigment within the iris tissues, anything affecting those factors may result in a difference of color being observed. 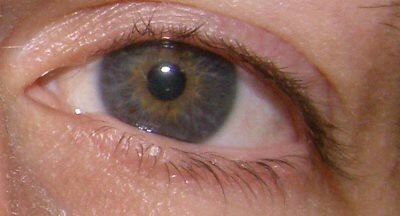 Central heterochromia appears to be prevalent in irises containing low amounts of melanin. Eyes displaying central heterochromia are often referred to as “cat eyes” because of the appearance of a multi-colored iris. Text taken from the Wikipedia article Heterochromia and licensed under the Creative Commons Attribution Share-alike 3.0 license. Truly fascinating 10-minute talk given by Eric Giler about MIT’s breakthrough version, WiTricity — a near-to-market invention that may soon recharge your cell phone, car, pacemaker without the need for wires. Is dolphin safe tuna an ecological disaster? However as shocking as the facts about the dolphin friendly method of purse seine fishing is it isn’t as shocking as the conclusion drawn by whysharksmatter, the author of the article. He quotes the following bycatch rates from here (a broken link to what looks like a Powerpoint presentation). Ten thousand sets of purse seine nets around immature tuna swimming under logs and other debris will cause the deaths of 25 dolphins; 130 million small tunas; 513,870 mahi mahi; 139,580 sharks; 118,660 wahoo; 30,050 rainbow runners; 12,680 other small fish; 6540 billfish; 2980 yellowtail; 200 other large fish; 1020 sea turtles; and 50 triggerfish. Ten thousand sets of purse seine nets around mature yellowfin swimming in association with dolphins, will cause the deaths of 4000 dolphins (0.04 percent of a population that replenishes itself at the rate of two to six percent per year); 70,000 small tunas; 100 mahi mahi; 3 other small fish; 520 billfish; 30 other large fish; and 100 sea turtles. No sharks, no wahoo, no rainbow runners, no yellowtail, and no triggerfish and dramatic reductions in all other species but dolphins. If you work out the math on this, you find that 1 dolphin saved costs 382 mahi-mahi, 188 wahoo, 82 yellowtail and other large fish, 27 sharks, and almost 1,200 small fish. This is entirely disingenuous because it suggests that there are only two methods of catching tuna both of which use purse seine nets and that the dolphin friendly usage of purse seine nets is the ecologically worse of the two. Greenpeace in fact advocate ditching the use of purse seine nets entirely and catching tuna (plus other commercial species of fish) with pole and line methods and many major British retailers are in line with this thinking. There is a brilliant new documentary called The End of the Line that is currently on limited release in the UK that explains these issues in far greater detail than I can here or pick up the book by Charles Clover that the film was based on (available at Amazon US or UK). My stream of consciousness review/nitpick of the movie Angels and Demons based on the novel by Dan Brown. Lab coats at CERN! Maybe, but not likely if they are doing all their science sat behind computers. I guess it’s a shortcut to indicate that these people are “scientists”. Looks like it was really the LHC and the Vatican. Apparently it wasn’t really the Vatican. The ambigram thing that is a significant plot point defies logic as they clearly have been created by the producers of the movie so naturally cannot have been nigh on impossible to create and believable as a thing of myth. Vittoria upon discovering Silvano murdered says “my God!”. In situations like that surely people revert to their first language which would be Italian in this case so “Dio mio” is more correct. Illuminati before they became violent were scientists who were driven underground. Extremely combustible material known as antimatter. Strictly speaking no it isn’t combustible, but how do you describe antimatter/matter annihilation and the resulting massive release of energy? The God particle is mentioned. Not in the book but makes more sense for this to be an issue for the Vatican and the questions over the creation of the universe that this raises. Two opposing forces will annihilate. Paralleling antimatter/matter annihilation with the Vatican/Science conflict. Destruction of the Vatican through light is the ancient Illuminati threat. Four fundamental elements of science. Fire, Earth, Air and Water. 1668 – Church kidnapped and branded four scientists. Neat framing for a thriller in that they have until midnight to thwart the plan to destroy the Vatican. Would the Camerlengo really be Irish? Energy research! In reality in order to create antimatter you need to put in more energy than you would get out. English is the language of radicals. Shakespeare and Chaucer! That is why Galileo used it for his secret path of illumination message. Treasure hunt where they only work out the next destination just too late. Better thriller than The Da Vinci Code even if it is based upon pseudoscience and religious myth and misrepresents the conflict between science and religion. – Stem Cell research is murder. – Condemning sick people to die. – Man is not God. There have been incidents in the past where the Vatican has tried to suppress science and scientists and many religious people nowadays feel under attack by those in the scientific community particular in regards to evolution. But the film really overhypes the situation. The conflict between science and religion isn’t really that extreme. It’s a race against time to save the cardinals and yet Langdon still has time to wash himself and change his clothes. Plus they are being extremely slow in the switching off lights sector by sector in the Vatican city plan. How does Vittoria, a physicist, have knowledge outside of her field of expertise and be able to describe the signs of a possible overdose of the Pope’s medicine? Why would the Vatican archives not have a failsafe should power be lost? In this case it is obviously not an accident as it would mean having to turn of the backup as well as the primary power to the archives. This coupled with the theory that the pope was murdered indicates an inside job and hence a very limited number of suspects. However neither group knows at this point of the information the other has gathered. Camerlengo arguing for a kind of Vatican III. End the brutal battle between science and religion. Science too young to understand. The pacing of the film is wildly off. The second hour i.e. between murders 2&3 is much longer than the first and third hours. Between the third and fourth murder 14 minutes shrinks to 5 minutes in about 30 seconds. Good misdirection with the mercenary, he’s in it for the money not for the cause, and then Commander Richter of the Swiss Guard acting strangely. Why was Silvano conflicted? Is it only about the so called God particle? Surely he was pursuing this area of study to prove God’s part in creation not dismiss God as creator. And again the Camerlengo must be lacking in faith if he believes that science was seeking to and could take away the power of creation. Doesn’t matter whether you believe or not events can be interpreted both ways. God sent Langdon to save the church or perhaps he did not. More factual errors made by Dan Brown in the novel Angels and Demons. CERN’s response to the questions moviewatchers may have about them and the LHC following the movie. Edit: More things occur to me regarding the film. Why reveal the plan to kill the cardinals at the appointed hours? It only introduces more chnace for the plan to fail. You can understand why the Swiss Guard might initially be distrustful of Langdon but why when he has proved himself as on the same side do they continue to hinder his efforts. Also the film will further the confusion of laypeople between the creation of antimatter and the search for the so called God particle at CERN.